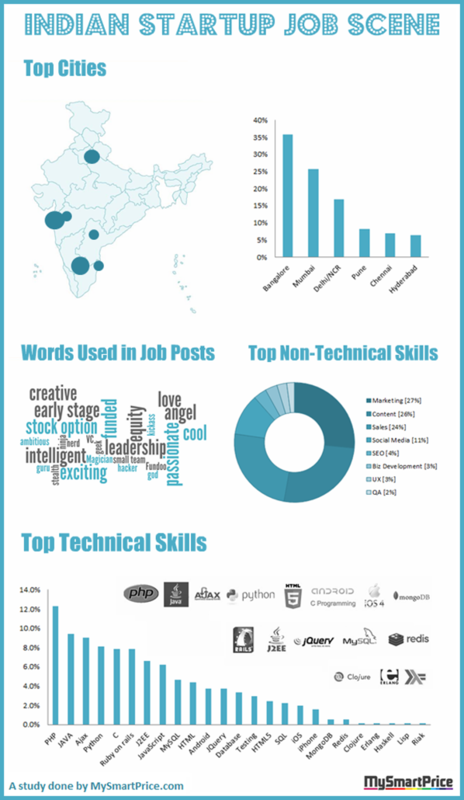 I just came across a very interesting infographic created by folks at My Smart Price giving insights on startups job scene in India. As expected – most of the startups lack Marketing & Sales people – that’s their biggest demand. I can tell you from my personal experience that finding a good marketing / sales person for a startup is like trying to find a needle in a haystack. There is no dearth of below average Marketing / Sales guys, but a good guys are just too rare. On the technology front PHP has the biggest demand, While Microsoft Technologies seem like a absolute No No for startups. Not a single job has been put for MS technologies. As far as geography goes, maximum startups jobs come from Bangalore followed by Mumbai & Delhi. Pune beats Hyderabad & Chennai in the startup job scene as well! Note: The infographic has been made based on data crawled from various Indian job boards. The list can be found on their blog post. Did DND implementation make any difference? Thanks for sharing most useful information ..